Now that spring clothes are making their way into stores I've finally been able to find a coral dress for the wedding that I'm in this March. I'm stuck deciding between these two. I really, really like the first dress, but the $28 price tag of the other dress is very tempting. If I got the second dress, I'd probably have it shortened to just above my knees, otherwise I think it would look a little frumpy. Drop waist lines are so in.. I looove the second. Totally agree though it needs to be shortened. 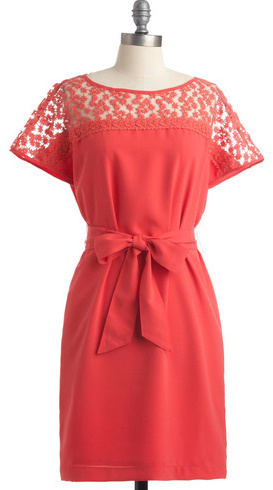 I have a small obsession with coral right now. Such a happy color!